Chavanga Fish Blog: Dry fly salmon fishing. Some experiments seem deprived of practical sense, simply absurd. I about catching of a salmon by small dry flies. If it was a question about bombers and provokers similar to them then it would be not necessary to mention it. Interest of a salmon to objects on a surface - history old and peculiar not only to the rivers of the north Kola. The same curiosity is shown by a salmon everywhere to the most different subjects dragged at a surface. Bomber it is only known in flyfishing a variant of a superficial bait. On a surface catch and metal lures. There is a method of catching of a salmon a wet fly which is close on presentation level to the dry. The fly fastens in asymmetric knot and at cast downwards and across moves at a surface. At most currents and directions of cast depends, as it will go. If to throw across, the fly is dispersed on an abrupt loop and goes with a wave at the surface. If to direct a cord downstream, the fly behaves more easy and leaves more deeply. This method of provocation described as riffling hitch, was at one time very popular. In it is a lot of nuances and to apply it costs not only on the salmon rivers. Bomber fly is intermediate between weighty lures and small on the size artificial flies. Its size and buoyancy have appeared approaching for traditional salmon tackle. But I think, matter is not in a flies, and in a furrow. The furrow involves not only salmons as chubs and other fishes react. It is possible to go further and to remember the fact of interest of salmon fishes described in the literature to a place of an input of a scaffold in water, here the furrow too is formed at bait movement. Therefore not ploughing bait which effect is almost natural, and persistence of catching on a usual drifting fly is curious. With salmons attacks on dry I considered episodes of last years casual, and did not try to give to them any ordered kind. I and now cannot systematise somehow catching of a salmon on a dry fly. The provocation element in small caddis, for example, is doubtful enough in my opinion. Not aggression, and curiosity or elements of food interest can be motive. Anyway fish pecked on usual grayling preparations. 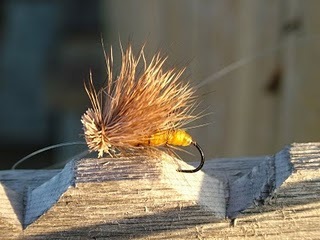 I remember simple deer hair caddis fly on barbless hook of 10-12 sizes, in it there was nothing special or special. Variants "dry" the technician, thus, happen are effective enough, though are engaged in them in almost exclusively summer. It is considered to be that at this time the salmon loves leaves to a surface. But activity of a salmon decreases in warm water, it reacts to standard baits is worse. Then, we think that business is simple in a low water level, and to catch there, where more small, on plums before rifts, on an example more correctly. But the salmon rises to a fly and on deep places, and not only in the summer, and so on. Uneasy to find sense in reaction of fishes to a dry fly. Probably, matter is not in fish, and that in the summer we are simply more inclined to reconstruct a fishing tackle on an easy harmony to indulge trout and grayling, and at the same time and to experiment with a salmon. Some moments of surface salmon fishing. he fly fastens in asymmetric knot and at cast downwards and across moves at a surface. At most currents and directions of cast depends, as it will go. If to throw across, the fly is dispersed on an abrupt loop and goes with a wave at the surface. I think that your method is very similar to riffling hitch, may be?